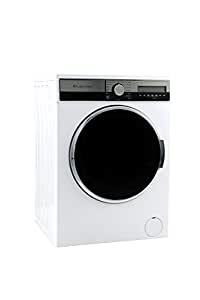 An 8kg front-loading washing machine with Eco Sensitive Tri Synergy technology, the LW8014 is European engineered and manufactured with quality German electronics. It has 15 fully customisable wash programmes with the availability to select from 3 stain levels, 0 to 1400 spin speed and cold to 95°C wash temperatures. Easy ironing options are available as well to help in the post laundering operations. Eco Logic auto set timing and water level adjustment as the machine determines the weight of the load ensures the maximum saving of water and energy. Other features include a unique detergent mix and spray injection system, an ‘Allergy Safe’ programme which can eliminate 7 allergens and 4 bacteria types, boomerang wall panels that provide stability, longevity and superior sound suppression, digital wash cycle indicator, add and remove garment pause function, and safety features such as overflow protection, excessive foam control, unbalanced correction systems, and child lock. There is a 3 year warranty on all parts and labour and a 5 year warranty on the digital drive motor. WELS water 4.5 star rating, MEPS energy 4 Star rating.